I have a pair of 168 Edollos mounted at recommended for a 307mm BSL length with Marker Griffons (Gripwalk compatible model). Skied maybe 20 days this year and hit maybe 10 rails with them. No damage to the edges sidewalls or bases. A few topsheet chips but nothing bad. 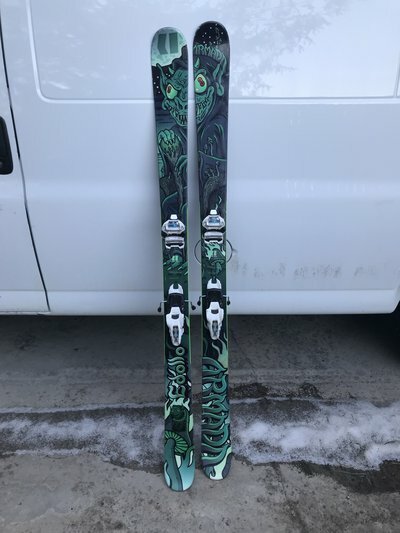 I’d prefer to trade for another pair of skis. But throw me some offers. I’ll upload pics later today. Are the griffons mounted true center? Jackschneider25 Are the griffons mounted true center? I’ll trade you some good condition 171 head caddy’s 18/19, just have 2 stupid base repairs but they were professionally fixed, less than 15 days on them and no edge damage at all. Trade fell thru. Trying to upload more pictures but the editor won’t work right. Pm me for pics.